Basal cell carcinoma (BCC) accounts for 80% to 90% of skin cancers and is the most common periocular malignancy.1,2 It is slow growing, locally invasive, and arises from the basal cells of the epidermis. Because BCC rarely metastasizes, any associated morbidity is usually caused by local invasion, tissue destruction,2,3 and cosmetic disfigurement. Early diagnosis and treatment are vital and result in better outcomes. Neglected or incompletely resected tumours can invade the orbit and cause loss of vision or even loss of the eye. Extension into the paranasal sinuses or cavernous sinus can be life threatening. Clinically, BCC can present as asymptomatic or minimally symptomatic lumps on the skin or as lesions that bleed and scab over repeatedly.2 Distortion of the eyelids, loss of eyelashes (milphosis), whitening of eyelashes (poliosis), and abnormal texture or colour might also be observed. Diagnostic suspicion is usually clinical, aided by good lighting and magnification3; however, diagnosis must be confirmed by histopathology. Biopsy is commonly employed for lesions that are accompanied by loss of eyelashes, ulceration, invasion or destruction of normal anatomy, irregular borders, distortion of eyelid margins, and bleeding. In cases in which deeper spread is suspected, imaging techniques such as magnetic resonance imaging or computed tomography are employed.3 Differential diagnoses include benign eyelid masses (eg, seborrheic keratosis, cysts, nevi, hordeolum, chalazia, mulluscum contagiosum, actinic keratosis, and squamous papilloma)8 and other malignant lesions (eg, squamous cell carcinoma and sebaceous cell carcinoma). Because of the variability in presentation, up to 40% of eyelid lesions might be clinically misdiagnosed. This can lead to delay in treatment and increased morbidity in the long run. Studies have shown that such false-negative results of clinical judgment occur at all levels of training and specialization, from family medicine to ophthalmic plastic surgery.9–11 In order to decrease the rate of potential clinical misdiagnosis of a malignant lesion as benign, Dr Kratky from the Department of Ophthalmology at Queen’s University in Kingston, Ont, developed a screening tool to aid in the decision-making process at the primary care level.12,13 Three clinical features are most consistently predictive of a malignant process upon clinical evaluation: “loss of lashes,” “ulceration,” and “infiltration” of normal anatomy.14 Together they comprise the “LUI key” for triaging eyelid lesions (Figure 1). (The term infiltration also encompasses destruction or replacement of normal tissue.) If any of these 3 features is present, the lesion is suspicious; either a biopsy should be performed or the patient should be referred to another specialist. The LUI key for triaging eyelid lesions: The presence of any of these features (ie, loss of lashes, ulceration, or infiltration) indicates that the lesion is suspicious for basal cell carcinoma. LUI—loss of lashes, ulceration, and infiltration. Morpheaform BCC is the next most common subtype, comprising 15% of all cases. It is usually a whitish-pink or yellow plaque with indistinct borders.2,8 It can also present with vague symptoms, such as blepharitis or ocular discomfort, without a clinically apparent mass.1 It rarely ulcerates but can invade deep into the dermis and even into the orbit or paranasal sinuses.2 Owing to the indistinct borders, incomplete excision of the tumour and subsequent recurrence can occur. Non-surgical treatment for BCC can be used as adjuvant treatment in high-risk cases or as first-line therapy in non-surgical candidates. These treatment measures include radiotherapy, photodynamic therapy, cryotherapy, chemo-therapy, and immune modulation. Although these procedures might save more tissue compared with surgery, their potential disadvantages include inability to assess margins histologically and the increased risk of complications such as scarring, contracture, eyelid malposition, and hyperpigmentation or hypopigmentation.6 Additionally, because the skin overlying the lower eyelid lies on an embryonic fusion plane, the risk of BCC recurrence is higher.6 This necessitates the employment of surgical excision with histologic control. Imiquimod is a toll-like receptor agonist that stimulates monocytes, macrophages, and dendriform cells to promote interferon-α and other cytokines important in cell-mediated immunity. Topical immunotherapy with imiquimod 5% cream is already approved for the treatment of BCC on the trunk, neck, and extremities. There is currently insufficient data to confidently recommend its use in the treatment of periocular BCC3; however, a small study that used imiquimod to treat nodular BCC of the eyelid in 5 patients reported positive cosmetic outcomes.17 Therefore, it is possible that with further research in oculoplastics, imiquimod might be a viable option in low-risk eyelid BCC for which good follow-up care can be established. Basal cell carcinoma of the periocular skin is a common cutaneous malignancy that rarely metastasizes. If left untreated, it can invade extensively into local structures resulting in substantial morbidity, including loss of the eye. If the condition spreads into the sinuses or the orbit (and the brain), it can be fatal. Basal cell carcinoma is diagnosed by biopsy and is most often treated with surgical excision and histologic confirmation of clear margins. Patients should be monitored for recurrence and counseled about sun safety. Physicians must always have a high index of suspicion when assessing eyelid lesions. 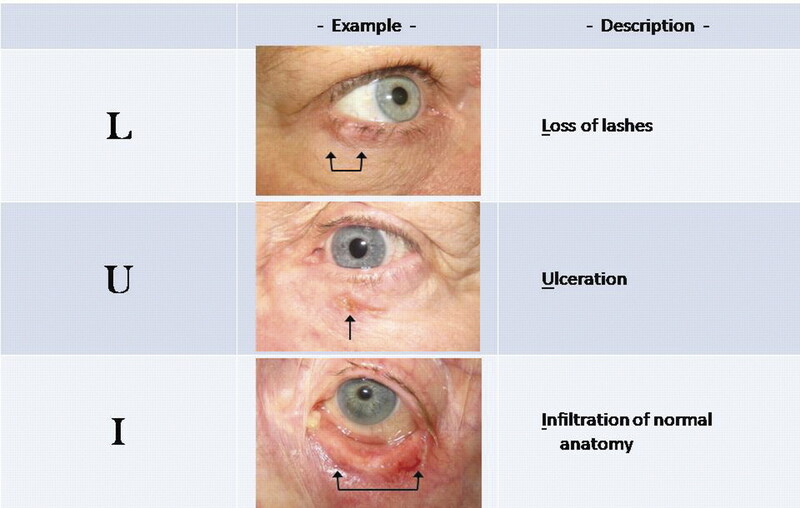 Application of the LUI key (Figure 1) when assessing any eyelid lesion can aid in earlier diagnosis and management.
. Basal cell carcinoma of the eyelids. Int Ophthalmol Clin 1993;33(3):1-4.
. Treatment options and future prospects for the management of eyelid malignancies. Ophthalmology 2001;108(11):2088-98.
. Guidelines for the management of basal cell carcinoma. Br J Dermatol 2008;159(1):35-48.
. Epidemiologic characteristics and clinical course of patients with malignant eyelid tumors in an incidence cohort in Olmsted County, Minnesota. Ophthalmology 1999;106(4):746-50.
, editors. Duane’s ophthalmology. 15th ed. Philadelphia, PA: Lippincott Williams & Wilkins; 2009.
. Basal cell carcinoma of the eyelid and periocular skin. Surv Ophthalmol 1993;38(2):169-92.
. Role of dietary factors in the development of basal cell cancer and squamous cell cancer of the skin. Cancer Epidemiol Biomarkers Prev 2005;14(7):1596-607.
. The Wills Eye Hospital atlas of clinical ophthalmology. 2nd ed. Philadelphia, PA: Lippincott Williams & Wilkins; 2001.
. Eyelid tumors: accuracy of clinical diagnosis. Am J Ophthalmol 1999;128(5):635-6.
. Diagnostic accuracy of benign eyelid skin lesions in the minor operation theatre. Orbit 2003;22(4):235-8.
. Accuracy of clinical diagnosis of cutaneous eyelid lesions. Ophthalmology 1997;104(3):479-84.
. Assessing the efficacy of an online video for teaching medical students how to triage eyelid lesions; Proceedings of the Canadian Ophthalmology Society Annual Meeting; 2008 Jun 11; Whistler, BC. Insidermedicine [website]. In the clinic: Dr. Vladimir Kratky, MD on eyelid lumps and bumps [video]. Pinellas Park, FL: CEH Inc; 2007. Available from: www.insidermedicine.com/archives/In_the_Clinic_-_Dr_Vladimir_Kratky_MD_on_Eyelid_Lumps_and_Bumps_1794.aspx. Accessed 2011 Jul 7.
. Pigmented basal cell carcinomas of the eyelids. Am J Ophthalmol 1981;92(2):193-7.
. Surgical margins for basal cell carcinoma. Arch Dermatol 1987;123(3):340-4.
. Efficacy of narrow-margin excision of well-demarcated primary facial basal cell carcinomas. J Am Acad Dermatol 2005;53(3):464-8.
. Treatment of basal cell carcinoma of the eyelids with 5% topical imiquimod: a 3-year follow-up study. Graefes Arch Clin Exp Ophthalmol 2007;245(8):1217-20.